New Biodegradable Products for the Washrooms and Paper Towel Dispensers! 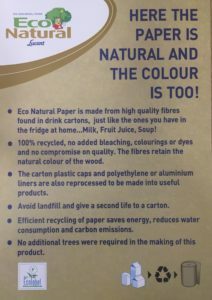 We are delighted to announce that we introduced new eco-friendly biodegradable products into the washroom areas and paper towel dispensers of the Aqua Dome and we hope to inspire you to do the same in your own home and workplace. We changed over from the old conventional white toilet paper, blue paper hand towels and liquid soap to the more environmental friendly eco toilet paper, paper hand towels and foam soap. This new changeover ensures the efficient recycling of paper which saves energy, reduces water consumption, reduces carbon emissions and also ensures no additional trees were required in the making of these products. We also introduced compostable green garbage bags a few years ago and we are committed to using these 100% biodegradable products into the future. With the assistance of our hygiene supplier HygiCare we decided on Lucart Professional EcoNatural products because of quality. Lucart Eco Natural Paper is made from high quality fibres found in drinks cartons, just like the ones you have in the fridge at home...milk, fruit juice, soup! It is 100% recycled with no added bleaching, colourings or dyes and no compromise on quality. The fibres retain the natural colour of the wood and are made from Fiberpack, the raw material obtained from recycled cellulose fibres present in beverage cartons. Every EcoNatural product packaging has the Fiberpack® logo, that guarantees the origin of the cellulose fibres obtained from recycled beverage cartons. Lucart Professional also combines the advantage of the single sheets dispensing system with the quality of its tissue products to guarantee maximum hygiene and consumption reduction with full respect for the environment. Lucart Professional EcoNatural line meets the requirements specified by the GPP (Green Public Procurement). GPP is defined by the European Commission as "a process whereby public authorities seek to procure goods, services and works with a reduced environmental impact throughout their life cycle when compared to goods, services and works with the same primary function that would otherwise be procured.” The European Commission wishes to encourage green public procurement which is an effective instrument in promoting environmentally-friendly products and services and in encouraging eco-innovation, thus contributing to sustainable development. A big thanks to all our staff, customers and members for supporting us on our environmental journey. Love the planet, be Kind to the Planet .